After wading through a sea of information, I understand the main differences between the white matter and grey matter of the spinal cord. I know that white matter contains myelinated axons in the ascending and descending nerve tracts from the brain to the spinal cord. I know that grey matter contains somata which contribute to sensory and motor functions from and to the peripheral nerve fibers. With the differences in mind, I am confused about the relationship between the two. The main question being: What signaling, if any, takes place between the myelinated axons of white matter and the somata of grey matter? More pointedly, do the myelinated axons from the nerve tracts in white matter ever synapse with dendrites from somata in grey matter? My guess is yes, that this is a key aspect in how the brain and the spinal cord communicate. But I haven’t yet found any definitive source that addresses this question directly. 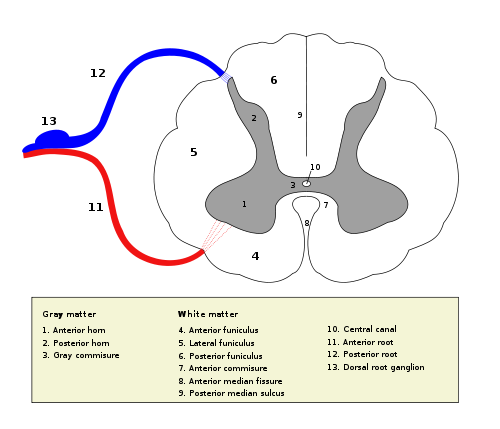 Here is a great diagram (from here) that outlines all of the different white matter tracts running up (blue) and down (red) the cord. The portion in the center, as you have found in your research, is the gray matter. In there are the different interneurons (cells that exist in the network to integrate information from descending controls and do further processing on it) and all of the different motor neurons. The corticospinal tract descends to the appropriate level (for example, a neuron in charge of moving your arm, to keep it simple, will have a cell body in the brain, and descend to the thoracic level), enters into the gray matter and either synapse on an interneuron or directly onto a motor neuron). The sensory neurons are a slightly different animal. Some (pseudo-unipolar cells) have what are basically two "legs", one that runs out into the periphery, which will take the signal from something like a Pacinian corpuscle in the skin, propagates a signal to the cell body, which is outside of the spinal cord in the dorsal root (see below), and the other "leg" runs all the way up the dorsal column into the medulla of the brainstem. So that should give you some idea of the two major tracts. To see some of the finer detail, you can look into the different layers (laminae) that the gray matter is composed of, so that you can trace the connections all the way in. Not the answer you're looking for? Browse other questions tagged neuroscience human-anatomy or ask your own question. Is the thecal sac ectoderm?